It's the silent killer in our recurring revenue businesses. But while churn is something all of us in the subscription world must deal with, knowing what does and does not influence it can help us survive and build a faster growing business. On this episode of the ProfitWell Report, Abhay Khurana, Chief Customer Officer at Feathr, asks us to look at the average revenue churn across dimensions like company age and price point. We studied just over three thousand subscription companies of all shapes, sizes, and verticals to answer Abhay's question, let's jump in to see what we found. Sign up to get the PW Report delivered to you each week. Interestingly enough, churn is actually much higher than you typically see publicly disclosed. 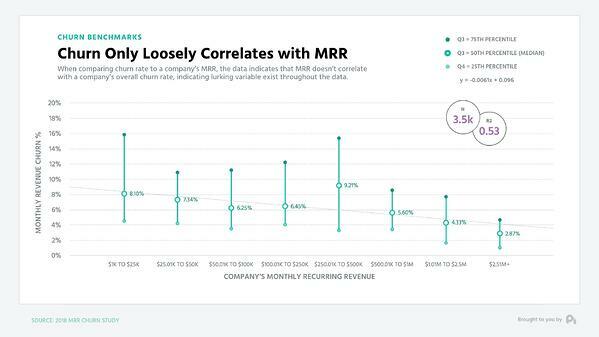 When looking at churn based on the size of the company, you’ll notice that churn only loosely correlates with a company’s monthly recurring revenue with wide interquartile ranges that fluctuate between 5% and 16% gross revenue churn on the low end of MRR and 2% to 8% on the high end of MRR. You’d expect that as a company grows, they’d be figuring out their churn, which in kind would help them grow quicker. Yet, this isn’t the case. Digging deeper down the the churn rabbit hole though we find that company age does present us with some good survivor bias when it comes to churn. Those companies who are older have dramatically lower churn than their younger counterparts. 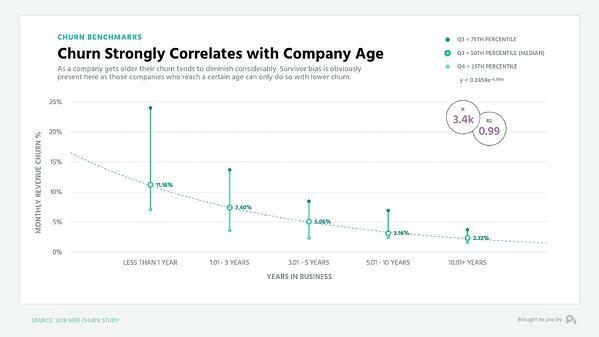 Companies who are less than three years old are seeing the interquartile range spread from 4% to a whopping 24% whereas companies who are 10 plus years old are seeing churn in the 2% to 4% range. While the model fits quite nicely, these companies of course survive through properly figuring out churn, because by that time, funding, patience, or at the very least interest will dry up with poor unit economics. That being said, you can’t control your age or your MRR with the flick of a switch. You do have significant influence over your ARPU through your pricing though - and it may be time to revisit that pricing to control churn. 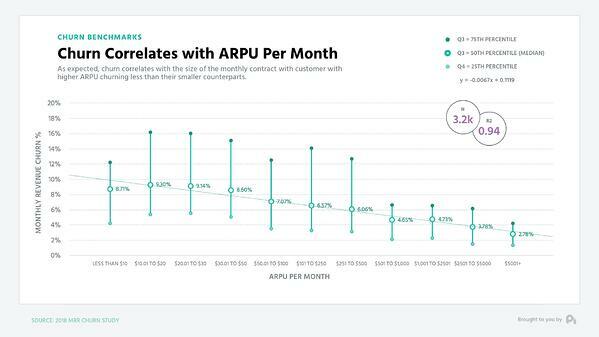 Those companies with low ARPUs see much higher churn than those with larger ARPU. If your average revenue per user per month is below $100, you’re likely seeing monthly gross dollar churn rates between 3 and 16% with a median between 6 and 9%. That’s a lot of churn. Yet, ARPUs over $500 see significantly less revenue churn with a range of roughly 2 to 6% and a median closer to 3-4%. 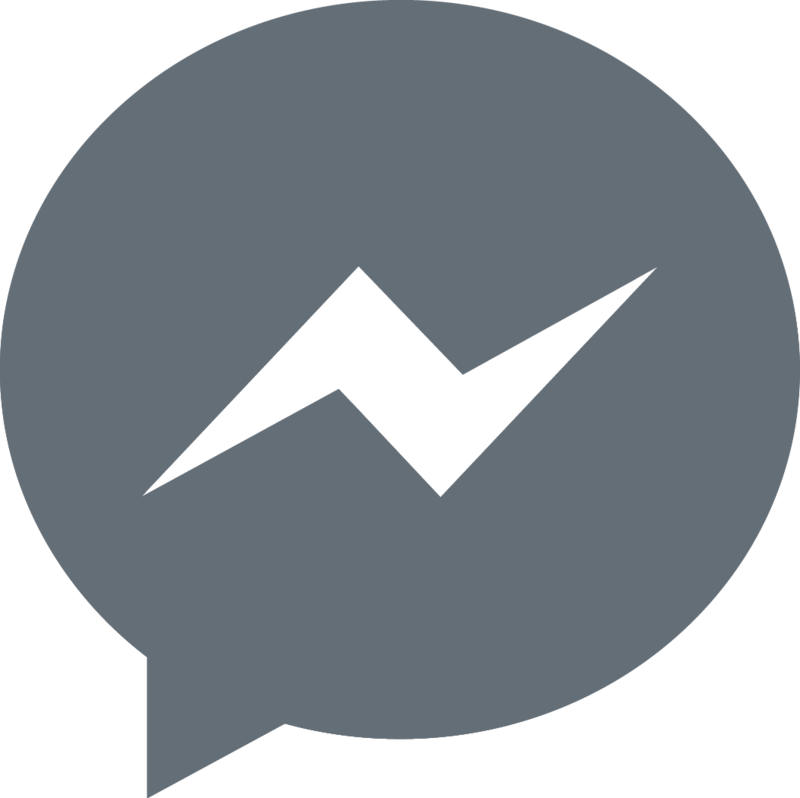 Of course, this is intuitive, as those higher ARPUs tend to come with more hand holding, annual contracts, and a deeper relationship with your customer - that which is afforded through higher revenues per user. 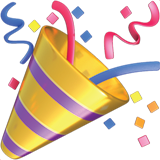 Well, that's all for now. If you have a question, ship me an email or video to pc@profitwell.com and let's also thank Abhay from Feathr for sparking this research by clicking this link to share on LinkedIn and give him a shoutout. We’ll see you next week.